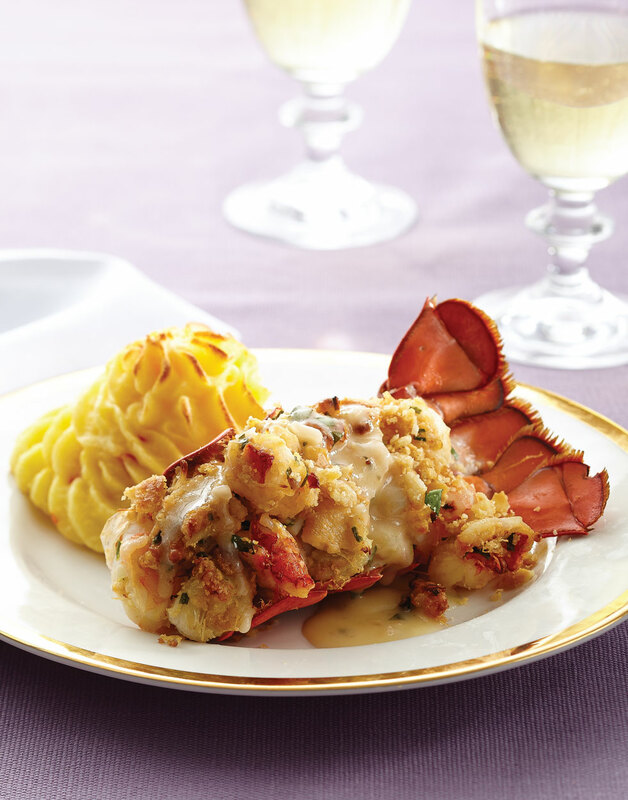 Seafood-Stuffed Lobster Tails with champagne butter sauce will dazzle your dinner guests. This recipe makes an elegant and fancy meal that's super easy to prepare. And yes, lobster tails are expensive, but special occasions are all about making guests feel pampered — this sensational seafood dinner most certainly will do just that. Lobster tails are flash frozen at sea. To thaw, leave them in the fridge overnight or run cold water over them for about an hour. For the lobster, prepare tails by cutting down both sides of the belly (not through the meat) to the fan. Remove meat, devein, and cut into 1-inch chunks; reserve the shells. Preheat oven to 400°. Place a rack on a foil-lined baking sheet. Melt 4 Tbsp. butter in a large sauté pan over medium heat. Stir in lobster meat, shrimp, and lemon juice; cook until seafood starts to turn pink. Add chives, zest, and cayenne. Off heat, stir in crabmeat and 1 cup cracker crumbs; divide among reserved lobster shells and arrange on prepared rack. For the topping, combine remaining ¾ cup cracker crumbs with melted butter and parsley; sprinkle over each stuffed tail. Roast tails until topping is crisp and stuffing is hot, about 15 minutes. For the butter sauce, reduce wine with shallots and thyme in a small saucepan over medium-high heat until liquid is nearly evaporated. Remove and discard thyme, then whisk in 8 Tbsp. butter, 1 or 2 cubes at a time, until melted. Stir in tarragon and season with salt. Serve stuffed tails with sauce. To avoid overcooking the lobster and shrimp, only partially cook them up front — they'll finish in the oven. Pasteurized crabmeat doesn't need to be sautéed before roasting, so just gently fold it in off heat. For a bit of crunch plus gorgeous looks, distribute the herbed crumb topping over the stuffed tails.